Flexible Magnets – Adams Magnetic Products Co. Flexible magnets are perhaps some of the most interesting magnets on the market. As their name suggests, these magnets are flexible, meaning that they have the ability to be bent and manipulated in order to fit a specific application or use. In addition to this, flexible magnets also have the ability to be cut to virtually any shape desired which makes them the go to magnet for custom applications. Flexible magnets are found in a number of different industries from manufacturing applications to use in schools, homes and many forms of business. They are found in such a variety of applications and industries because of their ability to be shaped and manipulated, both during and after the manufacturing phase, to fit a specific requirement. Flexible magnets are typically formed through two different processes, extrusion or calendaring. Deciding between the two different manufacturing processes depends mostly on how the magnet will be cut or manipulated later on in its use. Extrusion is done by squeezing the magnetic material into a mold where it is allowed to cool, forming thin magnetic strips. On the other hand, calendaring is a process in which a magnetic compound is passed through a roller until a magnetic sheet is formed. The thickness of the magnetic sheet can be manipulated based on the number of times it is passed through the roller. Once the magnetic sheet or strip is completed the cutting can begin. Obviously, if you require a larger flexible magnet, then calendaring may better suit your needs, since it allows you to cut from the larger sheet of magnetic compound rather than the strips that are created through the extrusion process. That being said, the extrusion process is the much preferred method due to its accuracy and efficiency when it comes to flexible magnets. 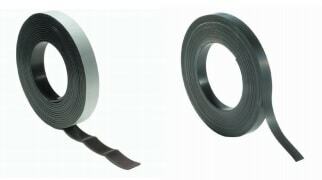 While flexible magnets offer a number of unique advantages over the more traditional, solid magnets, they are also less durable which makes them a liability in certain applications. The best way to ensure that you receive reliable, flexible magnets is to find a trusted and experienced flexible magnet manufacturer who is able to listen to your application in order to suggest the right solution for you and your applications. Flexible Magnets Magnets are products that serve a wide range of functions and applications, because of this they are found in a wide range of industries as well. Pretty much all magnets operate in the same way, yet there are a few different designs, materials, and styles to choose from when searching for a magnet.